Is there any greater Christmas wish for a retailer than to have a voice-controlled cash register in every home, lovingly sitting by the family hearth? 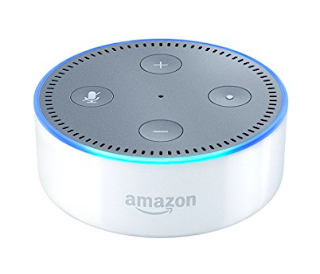 Amazon has accomplished just that by leveraging the cloud-computing power of Alexa with the Echo Dot, a hockey-puck sized peripheral computer. The possibilities now for Amazon are virtually limitless with Alexa acting as a personal assistant for almost any consumer desire available to be shipped to your door within an hour in many metro locations, and instantaneously for digital music or movies. Content has now become as simple as a voice command; a user's Amazon Prime account includes nearly limitless digital movie and music choices with thousands being added daily. For commoditiy products from paper towels to water to laundry detergent the integration of Alexa with the Echo Dot and the Amazon Dash button can fulfill even the most basic need. Jeff Bezos has succeeded beyond the wildest sugar-plum dreams of any child by successfully marketing Alexa as a personal assistant available for the ridiculously low price of $40! The evolving power of cloud-computing coupled with Amazon's distribution logistics arguably just ushered in the age of Artificial Intelligence with millions of Echo Dots installed in homes around the world.